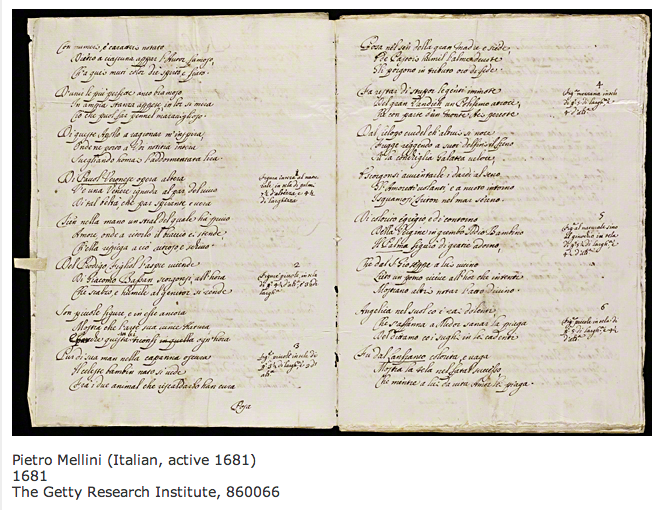 The Digital Mellini a collaboration between the Getty Research Institute and the Department of Art History of the University of Málaga, Spain, takes an unpublished 17th-century manuscript—Pietro Mellini’s 1681 rhyming inventory of paintings and drawings from his family’s collection in Rome—as a point of departure. The research team will publish the inventory online, building the manuscript into a more complex digital workspace that takes advantage of a wide range of technology tools and Web resources. The project will also explore Web 2.0 methods of social information gathering and sharing to create a new kind of living, collaborative publication that offers expanded opportunities for research and communication. Read more on the project website, and a blog post by Susan Edwards on creating this complex on-line research platform.